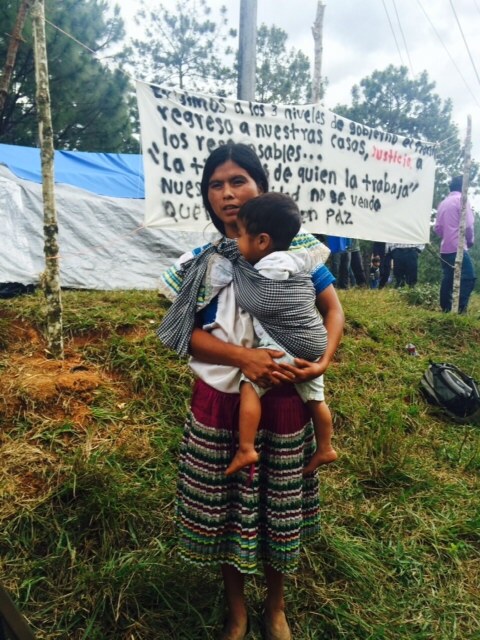 In a communique published on April 17, 2015, the forcibly displaced people of the community Primero de Agosto, released the latest harassments they´ve suffered on lands they currently occupy, next to the diversion of the road to Las Margaritas – New Momón towards Monte Cristo Viejo. In the public denouncement, they shared that from April 9-15, members of the ejido Miguel Hidalgo have fired three shots at 500 yards from where they are currently forcibly displaced, received verbal (shouts) threats, and entered and burgled the house of one of the displaced persons. It should be recalled that that those who are accused of the recent harassments belong to the Historic Independent Central of Agricultural Workers and Campesinos (CIOAC-H) and are also responsible for, both, the forced displacement of 57 people of the territory “El Roble” on February 23, 2015 and of the previous acts of threats, assaults, and aggressions. In voice of the displaced women, the statement includes a description of the physical and psychological health of the displaced persons:“… we are becoming ill due to the new threats of attacks and aggressions. Where are we now there is much insecurity, we are restless, uneasy and we cannot sleep due to the fear that the authorities of Miguel Hidalgo might harm us again and because they´ve told us they will kidnap our compañeros. Our children are ill with cough, fever, stomach aches, headaches, typhoid, and they always ask us when we will return to our homes.” They also demand that the government fulfills the agreements made on February 25 – in which it was agreed to distribute the 74 hectares of the Poblado Primero de Agosto equally between the two groups – the administration of justice, the return to Primero de Agosto, the punishment to the perpetrators and masterminds of the attacks, and comprehensive compensation for the damages incurred. Lastly, they hold the three levels of government responsible for whatever could happen to the forcibly displaced Tojolabal families, in case the conflict is not resolved.